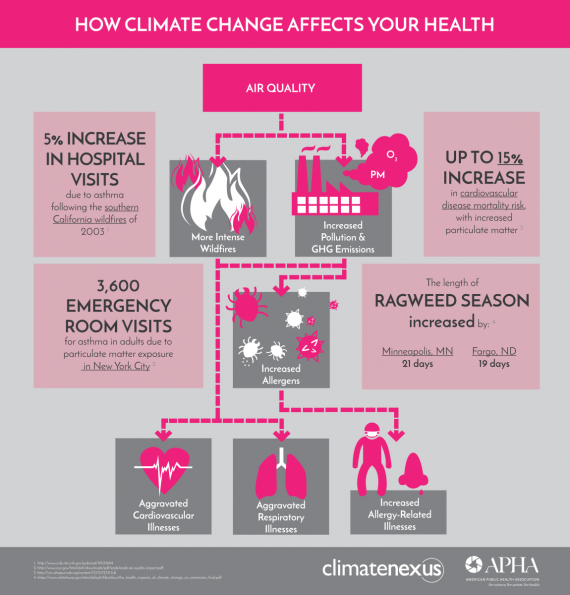 How is climate change affecting our health? WCQS’s Helen Chickering talks with a physician who is spending the second half of his career as a climate change health advocate and a local research scientist who studies the impact of climate change on public health and co-authored the first comprehensive scientific report assessing the health effects of climate change in the U.S.
Fall is officially here, marking the end of a very hot summer here in Western North Carolina and across the country. July went into the record books as the hottest month. Along with the scorching temperatures came floods in Louisiana, and the threat of Zika in Florida. 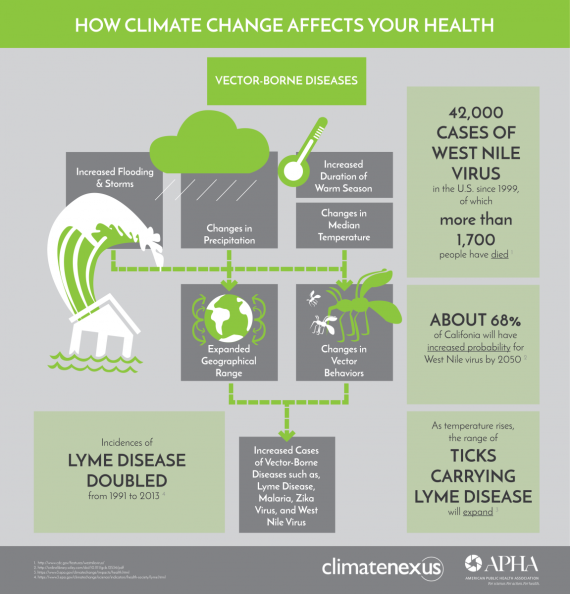 Extreme climate events in the Southeast that not only impacted the environment – but human health. And while the climate change-health connection is probably not a conversation you’ll hear in the doctor’s office today, the topic is gaining momentum across the country. "There’s a lot more to climate change than polar bears having a tough time of it because the ice is melting.” Dr. Alan Lockwood is a retired Neurologist and Emeritus Professor of Neurology at the University of Buffalo. Lockwood is among the growing number of physicians who are speaking out about climate change’s impact on human health. “Everyone in the United States and I would say the world, is affected to some degree by climate change and a lot of those impacts are going to be directly or indirectly on their health. “says Lockwood. Health effects linked to the increase extreme weather events – everything from Hurricanes to heat waves. “We’re already seeing changes in extreme heat events, which cause heat related deaths and illnesses, which is the number one killer in the United States as far as extreme events goes,” say Research Scientist Jesse Bell, who splits his time between NOAA’s National Center for Environmental Information in Asheville and the Centers for Disease Control in Atlanta. 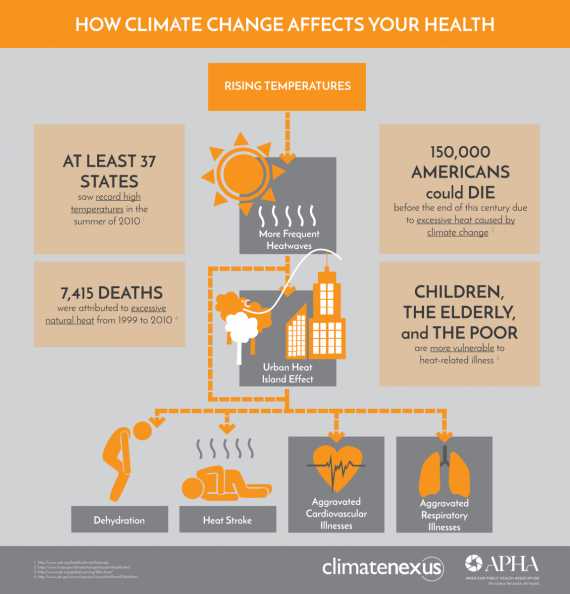 Those are just some of the findings The Impacts of Climate Change on Human Health in the United States: A Scientific Assessment, the first comprehensive report assessing the health effects of climate change in the U.S, released earlier this year. Bell was a lead author. “As we went through the report, there was no area of public health that wasn’t impacted in some way by climate change,” says Bell. Impacts public health officials here in North Carolina have been actively monitoring for a number of years. The state is one of 16 participating in the Centers for Disease Control’s Climate Ready grant program, created to help communities prepare for the changing climate’s impact on our health. “We’re going to continue to see changes in the frequency and intensity in the future, preparation is key. “ says Bell. 1. Monday, September 26, 2016 at 6pm -The Collider in Asheville, along with the WNC Chapter of Physicians for Social Responsibility and MAHEC, presents a discussion of climate change and its health implications led by Dr. Alan Lockwood, author of the book, Heat Advisory, Protecting Health on a Warmer Planet. 2. Tuesday, October 11, 2016 5:30-7:30pm, Climate Interactive in Asheville is conducting a World Climate Week simulation activity open to the public. 3. Friday, October 28, 5:30-7:30, Beer City Science Pub in Asheville. 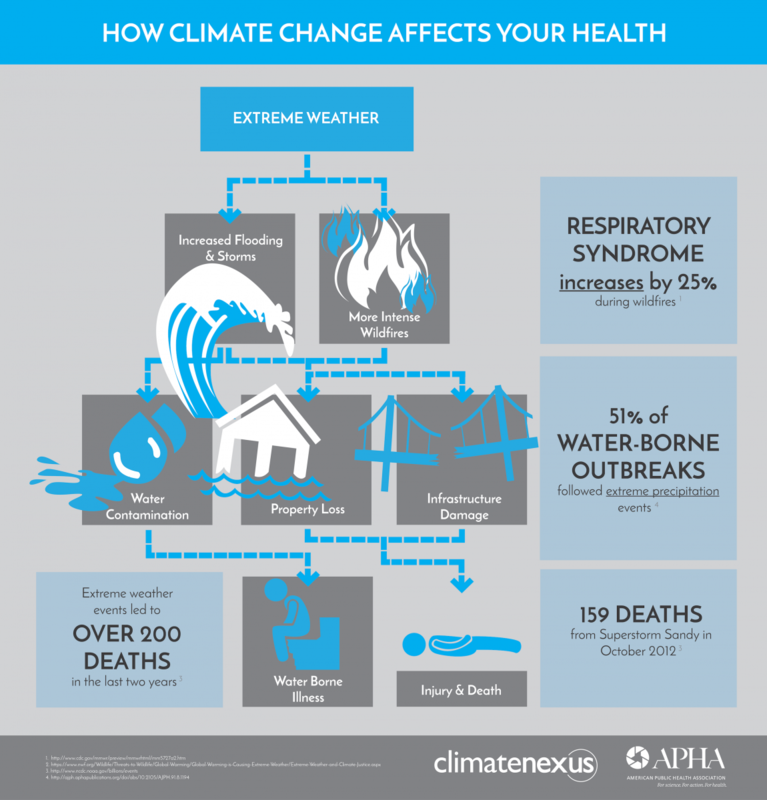 NOAA climate scientists discuss the impacts of climate change on human health.